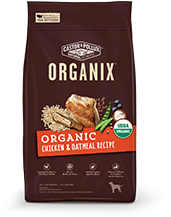 Since its debut in 2003, ORGANIX has been a leader in organic pet food as America’s #1 organic pet food. In 2017, we made ORGANIX even better. 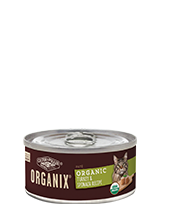 We elevated all ORGANIX recipes for dogs and cats to be USDA Organic, making it the only complete line of USDA organically certified pet food. 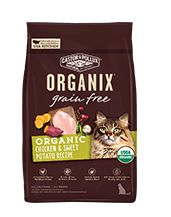 …is always organic free-range chicken or turkey. 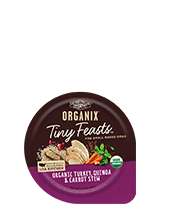 Recipes offer nutrient-packed superfood blends plus select recipes have additional nutritional benefits like probiotic & prebiotic fiber for healthy digestion in small breed dogs or Omega-3 fatty acids for healthy skin and fur. Recipes contain no corn, wheat or soy. Organic is always non-GMO. In fact, we have 10 recipes that are Non-GMO Project Verified. 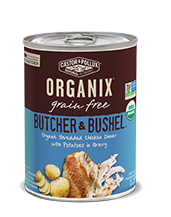 They are cooked in the USA in an organically certified kitchen. 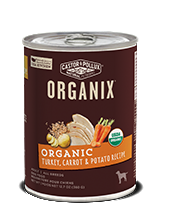 All ORGANIX recipes meet the extremely detailed and difficult third-party organic certification requirements of the USDA organic certification – this include requirements for each and every ingredient, our production process, organic ingredient storage and handling, and more. The USDA’s National Organic Program (NOP) regulates the way organic food and ingredients are raised or grown, handled, processed and stored. The NOP also governs what can be said on packaging, an additional requirement that Castor & Pollux has consistently applied. For more on the requirements of the USDA’s NOP, visit www.ams.usda.gov/nop or www.ota.com. A non-profit organization, the Non GMO Project is dedicated to the education and preservation of the non-GMO food supply and providing verified food choices. 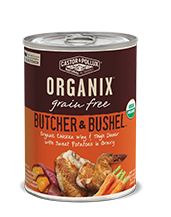 A selection of our ORGANIX canned recipes have gone through the verification process to ensure that these foods were produced in line with the best practices for GMO avoidance. Want to know more about the non-GMO Project and the verification process? Visit them at www.nongmoproject.org. 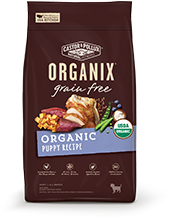 As the leader in organic pet food, we understand that extraordinary quality and nutrition start with exceptional and safe ingredients. 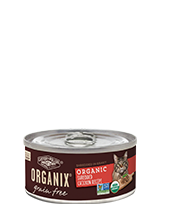 Here are some of those ingredients, click on an ingredient to learn more about how each benefits your pet. 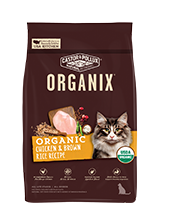 USDA-certified Organic, free-range chicken is a highly digestible source of protein and provides essential nutrition, such as amino acids, fatty acids and minerals. 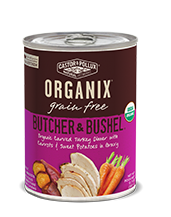 USDA-certified Organic, free-range turkey is a highly digestible source of protein and provides essential nutrition, such as amino acids, fatty acids and minerals. Organic blueberries are a superfood that are rich in antioxidants and other key nutrients. Organic coconut oil is a source of medium chain triglycerides that may help support optimal brain function. 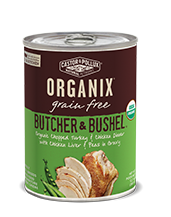 Organic Flaxseed is a source of fiber, antioxidants and Omega-3 fatty acids. Organic Oatmeal is a source of fiber, antioxidants, calcium and potassium. 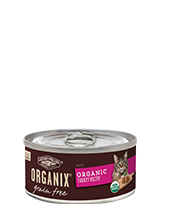 Organic Peas are a source of fiber, which assists in healthy digestion. Organic sweet potatoes are a rich source of dietary fiber, natural sugars, complex carbohydrates, protein, carotenoids, vitamin C, iron and calcium. Organic Spinach is packed with vitamins, minerals, omega-3 fatty acids, antioxidants and phytonutrients. Organic cranberries are high in vitamin C, dietary fiber and manganese. Organic Carrots are a source of beta-carotene and vitamin A.